Last night was my "Bag Lady" sewing class. I made this purse. It was s-o-o-o-o easy to make and I loved the process. I would like to make more. It has a magnetic snap at the top middle (inside) to help keep the contents of my purse intact. Notice the front outside pocket -- next time I want to stitch down the middle of the front to make two outside pockets. I only had time for one set of pockets on the inside of the back of the purse. I would like to make pockets on the inside of the front of my next purse too. 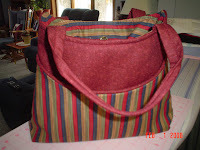 It was fun to see all the finished purses as everyone typically choose different fabrics. There about about 6 of us in this class, but I guess it is becoming such a popular class, the instructor is scheduling another class each month! really cute mommy! Teach me! Teach me!